New York University is doing away with its old, outdated swipe machines and replacing it entirely with new, modern and secure electronic card readers. According to Washington Square News, students will no longer have to swipe the magnetic stripe on their ID cards when entering certain NYU buildings. Instead, students will be issued contactless smart cards and can simply wave their ID card from at the new card readers for access. Card readers have already been installed in most buildings, residence halls, as well as the school’s library. 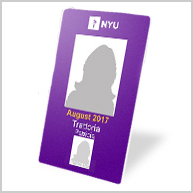 This follows NYU’s summer announcement that it would issue new ID cards to students. The new issued ID cards coupled together with the electronic card readers provide a higher level security, in addition to enabling students quick and easy access to campus facilities. Even the university’s study abroad sites, NYU Abu Dhabi and NYU Florence, are using the new technology. All other sites are scheduled to receive the new readers by next January.